The importance of publicly engaged scholarship in the humanities is the subject of a new book by Harvey Teres, associate professor of English in Syracuse University’s College of Arts and Sciences. 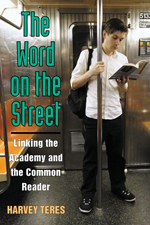 “The Word on the Street: Linking the Academy and the Common Reader” (University of Michigan Press, 2010) is a timely look at the disjunction between the study of literature in the academy and the interests of the common reader and society at large. “The Word on the Street” is made up of several compelling chapters, including “Post–9/11: Why the Public Needs Literary Critics,” which looks at how The New York Times famously mishandled Joseph Conrad’s and Henry James’ writings about terrorism and counterterrorism. Also, there are chapters devoted to heretofore neglected book reviews that Lionel Trilling wrote for the New York Evening Post, as well as Mary McCarthy’s and Susan Sontag’s musings on the intersection of beauty and politics. “These people were public intellectuals who wrote about books with subtlety, style and commitment for a broad public audience,” says Teres. Another chapter outlines Teres’ efforts to take literature “into the streets” with such interactive events as “Poetry Palooza.” He recalls one weekend at Syracuse’s Carousel Center, where more than 100 passersby read aloud their favorite poems, as well as created original works using refrigerator word magnets: “It was a fun way to use poetry to engage the community,” he says. “The Word on the Street” concludes with a series of conversations with local citizens—including an auto restorer, a community choir director, a labor organizer and a dancer—about their encounters with beauty. “Their words show us the central importance of craft, beauty and aesthetic judgment in our lives—things that are too often neglected in our classrooms,” he adds. Already, “The Word on the Street” is creating a stir in the academy. SU Chancellor Nancy Cantor calls the book “lively and thought-provoking. It invites humanities scholars to move beyond the classroom and the monograph to share the pleasures of art in ways that engage the intelligence of the common reader, cultivating the critical imagination so vital to American cultural democracy,” she writes. Critics agree that “The Word on the Street” is a bold response to the current malaise in literary studies. “Innovative” and “accessible” are among the adjectives that frequently appear in reviews. For more than two decades (first at Princeton University, then at SU), Teres has used university-community partnerships to create fruitful, reciprocal exchanges in which “expertise is on tap, not on top.” Witness his recent work with the University Senate’s Academic Affairs Committee, through which he helped usher in the new University tenure policy for publicly engaged scholarship. Teres has also chaired SU’s Humanities Council and the Imagining America (IA) National Conference Organizing Committee, the latter of which supports public scholarship in the arts, design and humanities. “The Word on the Street” is the second installment in a groundbreaking, new series put out by the University of Michigan Press, titled “New Public Scholarship.” More information is available at http://press.umich.edu.